Being Frugal and Making It Work: My Breast Cancer Story: A Year Full of Treatment, Surgeries and Emotions! I heard the words that I will never forget... "I'm sorry, you have breast cancer!" I felt like I had just gotten the wind knocked out of me. How was I going to get through this? Immediately so many emotional thoughts were running through my head. My kids are only 12 and 15, I still have SO MUCH to see and do with them! How could this be happening? The first two weeks were a blur. All I did was cry. Pictures, songs and thoughts made me cry within seconds. It was appointment after appointment, MRI, Petscan, blood work. After the initial shock set in, I realized that I had to FIGHT! I had to fight for my life, for my children, for my husband, for my family for my friends... I wasn't going to let breast cancer win! My chemo began on November 21st. My breast cancer was high grade stage 3 and had already moved to my lymph nodes. Treatment was going to be aggressive! 4 rounds of AC, once every 3 weeks for 12 weeks then 12 weekly treatments of Taxol for a total of 16 chemo treatments. Last treatment was May 9th. I lost my hair and my emotions were on roller coaster mode. But I couldn't let breast cancer break me! I had to "fight like a girl!" I had to keep my head up and show my kids what it meant to never give up no matter what life throws at you! The morning of May 10th, about 15 minutes after I got to work, there was an all staff call to the teachers lounge, when I walked in... all the teachers were wearing pink and cheering for me! 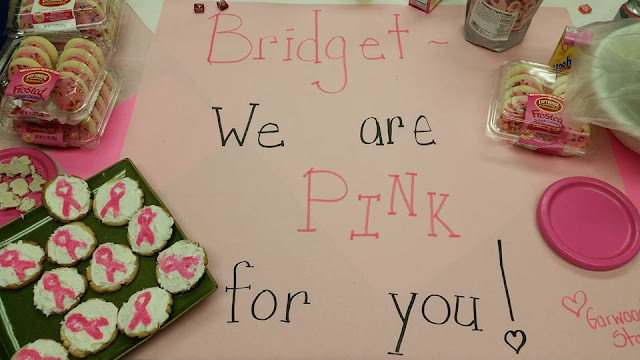 The table was also covered with pink decorations and pink food and drinks! Next was a partial mastectomy on June 2nd. We didn't end up with a clear margin, so I was back in for another surgery on June 9th... that one was clear! The additional breast tissue they removed was negative for tumor, so he must have been right on the edge of it the first surgery. 4 of the 18 lymph nodes they removed were positive. So 6/22 nodes had cancerous cells. Then it was time for radiation. My radiation began on July 13th. 33 rounds of radiation... DAILY (Monday - Friday) for 33 days! My last treatment was on August 26th, just one week before the kids went back to school and I went back to work. Throughout the entire treatment process, I didn't miss a single day of work - except for treatment days. In the beginning when I told my oncologist that I worked at an elementary school, he told me that I would probably have to quit my job since chemo can weaken your immune system. I took every precaution to stay healthy... and I worked the entire time! This past year wasn't the most pleasant. My family and I REALLY learned how to enjoy the simple things in life and how not to be upset by the things that you can't control. Life is precious and worth fighting for! I'm so thankful for the amazing support system that I had during my struggle. I couldn't have gotten through it like I did without all of them! My advice... check yourself early and often! If you notice something that doesn't feel right - get it checked out! Don't think that you are over-reacting. It's always better to be safe than sorry! I'm so happy I followed up, who knows what the outcome would have been if I would have ignored it! Wow, that's an incredible journey you've been through, thanks so much for sharing your story! Earlier this year I had a breast cancer scare and was so relieved when the biopsy came out clear. We lost my grandmother to breast cancer (when my mom was still in high school) and my mother has had a double mastectomy so I felt like I was on a roller coaster through the whole process but it's nothing compared to what you went through. I'm so glad that you "fight like a girl" and that you've had a great outcome! I found a lump in my breast 11 years ago and had it removed. I was beyond thankful for it to be benign. Thanks for sharing your story! Wow, what a story! You are the definition of a fighter! Oh my gosh! I am glad that you caught it before it could have spread further. Thanks for sharing your story and encouraging others to be proactive. You are truly amazing! To go through all of that and have such a positive attitude! I am so happy for you! I know a couple of women with breast cancer. I have never been checked, but need to. Thank you for sharing about your experience. I appreciate you being vulnerable! 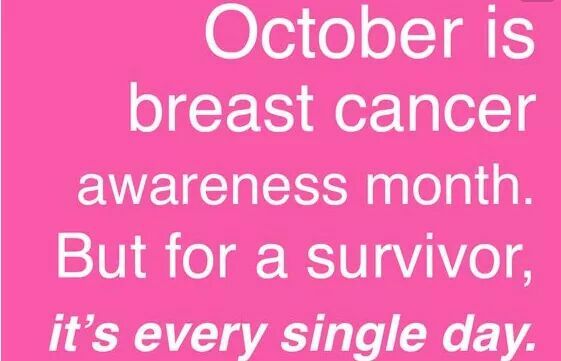 My mother-in-law is a breast cancer survivor. My sister in law is currently living with terminal brain cancer. I hate cancer and I love preventive education like this. So again, thank you! Wow, what a year you went through. So glad things turned out well for you! I can only imagine how hard it was. Good advice — better safe than sorry. Good for you for getting it checked out! Your story makes it clear, I need to make my appointment NOW. Girl! You are one tough cookie. So grateful you are sharing your journey with others - you may very well save a life! Thank you for sharing your story! I bet this will comfort those who need it and see that they're not alone. What a journey. Congrats on every milestone. So glad you have such a fantastic support system. Bridget ... I read your post, and I didn't know what to say. So, I've been thinking about you and your fight, and now I'm back to read it again ... and I still don't know what to say. I'm so sorry you had to go through this, and I'm so happy that you found the bump when you did. You are a fighter, and I cannot wait to read your "I'm in remission" post and the "I'm cancer free 5 year" post. Thank you for sharing your story! I've been going through something similar for the past several months, but thankfully it seems like it was a false alarm. But I recognize so many of the emotions you mention. You are so brave for writing about your journey, and who knows ... you might just save other people's lives for doing so. Bridget, I still don't know what to say, and everything I type come out wrong, but I want you to know that you are in my thoughts and that I'm sending lots of positivity and strength your way. You are a fighter, and you will fight this until you can claim absolute victory.